A Teesside consultant has become the sole recruitment supplier to a local engineering company. Techconsult UK managing director Steve Guest is delighted to be continuing this partnership with Axiom and is excited to be there to see the company continue to grow. 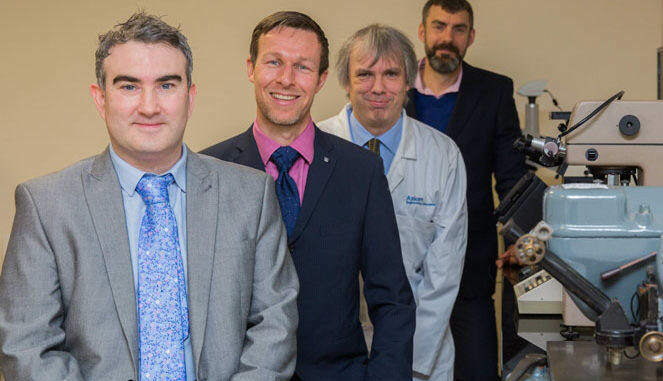 “Axiom is highly focussed in what it offers,” said Guest, pictured above (second left) with lead recruiter Iain McCabe (left), and Dr René Hoyle and Rob Johnson from Axiom Engineering. “It is one of the most successful independent inspection and preventative maintenance specialists working in the UK process, manufacturing, automotive and renewable energy sectors. Over the last five years Axiom has sustained 15-20% year-on-year growth and looks to continue in the same vein over the next five years.